Fancy meeting creepy creatures, following the spooky trail or carving your own pumpkin? Halloween at Monkey Tree Holiday Park promises to be the best ever, with a week of fun and games for the whole family. There’s plenty for the little ones to do during their stay at Monkey Tree. Join the Kids’ Club every morning from 10:30 for spooky games, creepy creations, crazy golf, pumpkin carving and a Halloween hunt. Tire them out before bedtime with the Kids’ Club, every evening at the Holiday Park from 6:30pm. 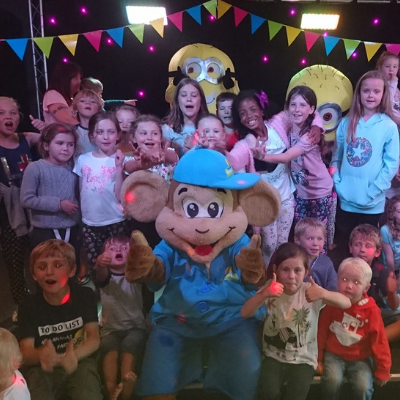 Funky Monkey will be leading the dances at the mini disco, keeping the laughs coming with his magic friends Billy Wiz and Paul Zee. The Horror House opens its creaky doors on Thursday 25 October – the team have gone all out this year, with a surprise around every corner. Are you brave enough to take on the Horror House? This attraction isn’t for everyone – if you have a weak heart, an aversion to flashing lights, a fear of the dark or any other perfectly rational fears, then the 2018 Horror House might not be for you. There’s nothing scary about winning money, which is why the daily cash bingo has made it into our Halloween list, bringing a little ligh relief from the action, excitement and adrenaline of the other attractions. All you need is a bit of a luck and a good ear. Look out for two fat ladies, two little ducks, legs eleven and clickety-click. Get your dancing feet on for an evening of top tunes, banging beats and moshing melodies. The Club House, with its fully-stocked bar, comes alive every evening during the half-term week as the music kicks off and you’re invited to hit the dance floor. Live entertainment is scheduled in the club house every evening. Be amazed as tribute act Megan performs as the multi-award winning Adele, see hilarious impressionist Paul Burling, and dig out the leg warmers and lace for an 80s party night. The October Half-Term Spooktacular ends on a high with a grand fancy dress ball on Saturday 27 October 2018. As well as live music from X-Factor’s Benji Matthews, there will also be prizes for the best dressed, entry to the two horror attractions, and loads more entertainment, fun and games. Also, don’t miss out on the Party Buffet – buy your tickets in advance and tuck into warming hot food, served from 8:45pm in the Clubhouse. Tickets are just £5 for adults and £3.50 for children. Purchase your buffet tickets from main Reception or call 01872 572032. * £7 per person per night based on six sharing the Porth Holiday Home from Saturday 20 October 2018 for 8 nights. 1 extra night free applies to phone bookings only. Subject to availability. Not to be used in conjunction with any other offer. Call 01872 572032 to book.